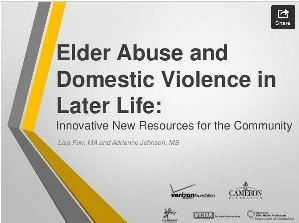 This archived webinar and power point presentation address the issues of elder abuse and domestic violence in later life. Additionally, they provide the faith-based community, service providers in aging and violence prevention and other interested individuals with a key new resource to help them respond appropriately and assist people in abusive situations to get the help they need. Lisa Furr with the Virginia Center on Aging and Adrienne Johnson with SeniorNavigator presented with Dr. E. Ayn Welleford (Virginia Commission on Alzheimer’s Disease and Related Disorders/Virginia Commonwealth University) moderating.